In 2004, San Francisco Beautiful recognized Adah Bakalinksy with a Beautification Award. Since childhood, Adah Bakalinsky has loved exploring by foot. 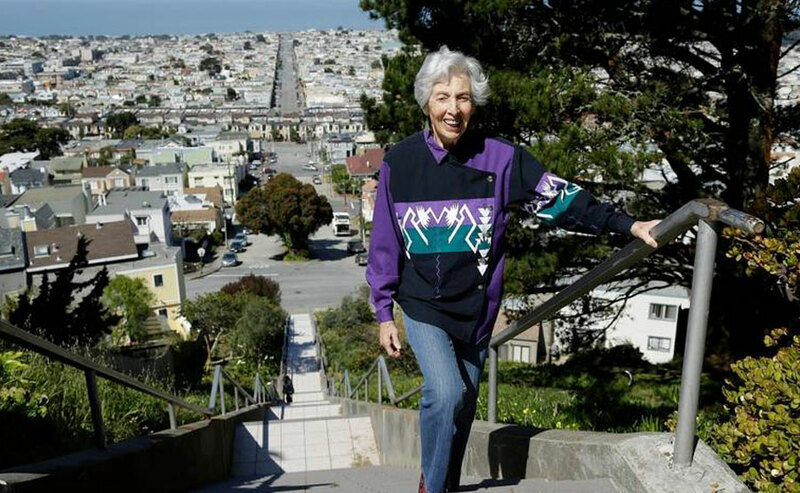 At 81, her many years of climbing the stairways through San Francisco neighborhoods perched upon the city’s 42 hills has led to an extensive knowledge of any given area’s history, geology and denizens that can only be gained by someone who has been there many times on foot. Lucky for us, Adah has put her insights into “Stairway Walks in San Francisco.” This book, now celebrating its 20th anniversary, guides readers along many of the paths created by San Francisco’s 350 plus stairways. Since the 1980s, Adah has played a pivotal role in stairway improvement projects. Her contagious enthusiasm and heartfelt encouragement have aided volunteers in formulating plans for stairway creation and accompanying garden improvements. Adah has done much to make stairway gardens a focal point for neighborhood activities. With her ‘can do’ spirit,whole neighborhoods have come out of their secluded homes and formed work parties to beautify these public right of ways.